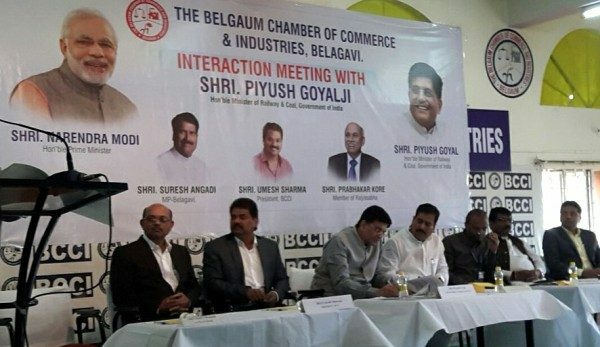 Some snippets of the interaction of Shri Piyush Goyal Minister of Railways and Coal, Government of India along with the members of the Belagavi Chambers of Commerce and industry at Udyambag hall. More trains need to be started between Belgaum and Miraj ,BGM to vasco daily ,Belgaum to Ajmer,Belgaum to Bangalore and Mumbai,BGM to Delhi .Lets the doubling work speeds up . Belgaum-Miraj passenger trains must be extended upto Sangli so that villagers from Raybag, Chikodi, Kudachi, Shedbal, Gokak and Ugar can reach Sangli. Also this will provide two more trains between Belgaum and Sangli.